With New Year just around the corner and it is a time to wish people in the most unique way. Here are some Apps in Android which will let you enjoy New Year with various types of Apps like Wallpapers, Live Wallpapers, Timers, Countdown, Greeting cards, Sms Apps. Download all the apps and make this new Year a special one for you and your friends and family. 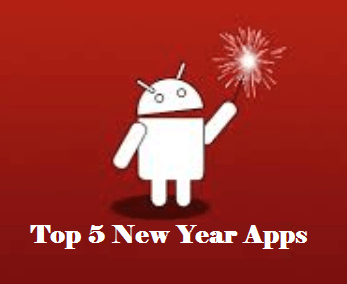 The New Year Apps are compatible with Samsung, HTC, LG, Motorolla, Micromax devices. New Year Greetings: This is a great app which lets you create custom Greetings with the persons photo who want to send the greetings to. There are many Frames into which you can add custom photos and make a personal Greeting card. New Year Live Wallpaper: This is another great app which will let you prepare your Android device for New Year with a great set of Live Wallpapers which on tapping on the screen will get you sparkles and Fireworks. This is a great Live Wallpaper for Free. New Year SMS: This is a good app to get great ideas on messaging new year wishes to your friends and family, there are many wishes for you and you can simply send the messages directly from the app to your contacts. Go Locker Happy New Year Theme: Go Launcher has some great set of themes which will let you change the whole look of your device and there is this theme for New Year which gives you a Happy New Year themed Lock Screen. This looks great on your device for New year and we can use it for weeks after Jan 1st as well. New Year Fireworks Live WP: This is a beautiful app which transforms your Android device completely making it fit for a New year celebration. As the name suggests the app lets you display Fireworks and you can keep your own custom photo as a background on which fireworks are displayed.